Zach kindly let me have a prototype of his latest Sanguino board. I've just installed it on my RepRap (above) and it runs just fine. The Sanguino is great as a RepRap controller, and I have been using one on my machine for months. But Zach rightly designed it as a general microcontroller with RepRap as one application, not specifically for RepRap. 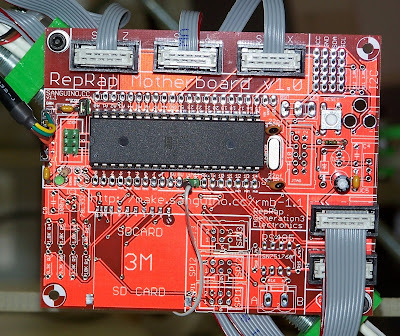 He has now used the Sanguino as the basis of a dedicated RepRap motherboard, which is what is in the picture above. This has insulation-displacement connectors on for wiring to all the RepRap Generation 2 electronics, which makes it really quick and easy to hook up. In addition, it has the components that will allow us to move to the Generation 3 Electronics, which will be needed for RepRap Version II "Mendel" somtime next year. Those extras are an SD card socket, which will allow an SD card with a G Gode file to be plugged in and run on the machine, so the RepRap doesn't need to be attached to a host computer to build things. It will also have RS485 communications to allow it to control an expanding number of other PCBs, particularly for multiple extruders and hence multiple materials. The hair dryer works remarkably well as a means of creating a constant warm environment for building with ABS. This prevents both curling and delamination. But it can be a bit hit-or-miss, and is also noisy and uses a silly amount of power (1.4 kW according to its rating plate, or - to put it another way - over 20 times as much as the whole of the rest of the RepRap machine...). Forrest had a brilliant idea: use an oven roasting bag to enclose the build in a bubble of warm air. 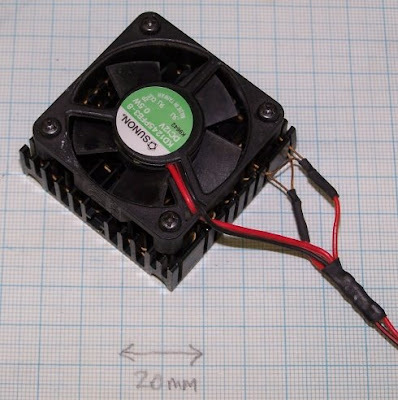 So, from a suggestion by Nophead, I built a miniature fan convector (above). It's an old processor heatsink and fan with two 10-ohm pieces of nichrome wire woven in among the heatsink fins. They're in parallel, and at 12v will give about 30 W. As an alternative you could obviously just bolt a fat 4.7-ohm resistor on the back. Then I phoned Christine and Sally (w. and d.; they were out buying things for some sort of festival that they claim is imminent; I think they're trying to pull the financial wool over my eyes...) and asked them also to buy oven bags. I bolted a sheet of balsa (previously used to build on) just under the extruder mechanics and duck-taped the bag to it and to the build base. I moved the machine about to make sure there was enough slack to accommodate a build. This was a bit tricky, as too much and folds would have got in the way. The cream object to the right of the picture is a thermometer. With both the extruder on and the mini fan convector the temperature in the bag stayed pretty constant in the top sixties. Another part of the newest granule extruder. Holding a rule against its base and squinting at the light in any gaps reveals it to be as flat as a pancake in Flatland. Clearly the bag arrangement could be considerably tidied-up with the addition of some concertina folds and springs and so on. I don't know what polymer they use, but the extrude head (internal temperature 240 oC) came to rest against it several times and didn't cause any damage at all. A rather good side effect was that the slightly acrid smell of molten ABS was completely enclosed and thus eliminated. Even when I opened the bag at the end no smell emerged, implying that the volatiles had condensed inside. 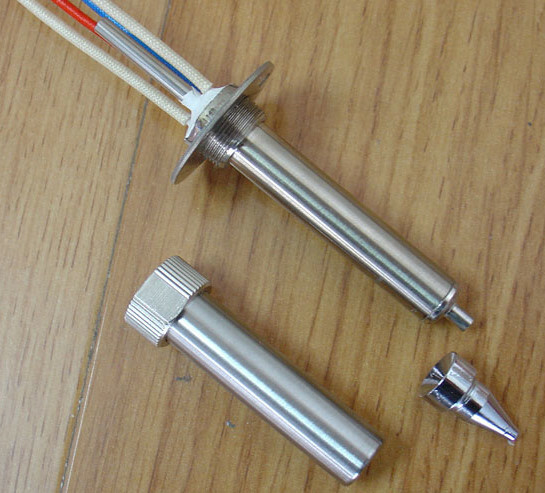 sid, who is a regular contributor to the RepRap forums, had an idea to get a soldering iron manufacturer to make a heater barrel assembly for RepRap. He approached a Chinese company with a specification and they sent him some prototypes. He forwarded one to me for testing. It appears that they ignored his specification and just sent a standard de-soldering iron element. Nevertheless it is a nice unit and looks eminently usable. It works perfectly apart from one fatal flaw, full details in my blog. 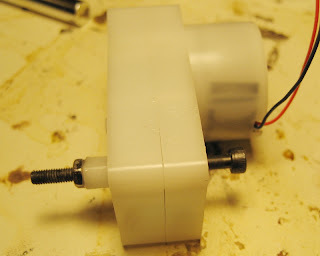 There was some discussion in this post regarding hacking a GM3 into a non-captive motor. Partly out of curiosity but mostly out of bloody-minded stubbornness, I decided to give it a shot. I couldn't find a spare GM3 but I had a GM17 lying around. It, like the GM3, has a coaxial pinion on its shaft. Turns out it's possible to drill right through both. A 1/8" bit makes a hole big enough for an M3 screw but small enough not to ruin the pinion. 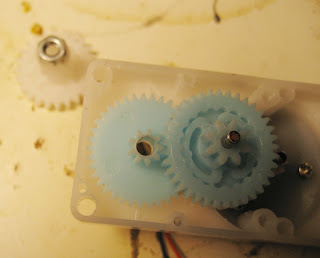 I took apart the motor, removed the steel axle and drilled out the gears. I put an M3 screw in place of the axle, glued an M3 nut onto the shaft and reassembled the motor. I doubt the glue would take much torque. Need a much more solid connection. The M3 screw ends up acting as an axle for two gears rotating at different speeds. No idea what kind of wear that will produce. On the other hand, the screw does move back and forth just like you'd expect, as long as you keep it from rotating. UPDATE: Here's a shot of the same motor pulling 3mm ABS directly. The GM17 doesn't seem all that powerful but it was able to pull the filament fairly well. Oddly enough, it was relatively easy to keep the filament from turning, just by holding it in a gentle 90 degree bend (say, 15cm radius). I wanted to find out which motor lends itself best to a paste extruder design. I came up with some rough prototypes and pitted Fab@Home's non-captive stepper from Haydon (left) against our old favourite, the Solarbotic GM3 servo (right). Both designs worked great, however, the non-captive stepper design was radically simpler with significantly less fiddle and faff (hats off to Evan from F@H for going with this principle). Unfortunately, this particular non-captive stepper (Haydon, 28000 series) is worth $100+, and with cost of the RepRap an ever-pressing issue, we are investigating cheaper non-captive alternatives. From the design point of view non-captive is the answer. Could we make the GM3 non-captive? That being this - my attempt to make a granule extruder. It worked perfectly first time, but - after it had cooled and then re-heated for a second run - the plug of solidified polymer wouldn't shift, regardless of how much welly I gave the motor. Nophead had the same problem when he tried this, but I thought my use of PTFE might have fixed it. No such luck. It was too big anyway. This is my new vertical design based - as you can see - on the existing filament extruder drive and motor (M). The nozzle and PTFE arrangement (N) at the bottom are the same as the current extruder too, except the internal diameter is 4mm. It'll need smaller granules than standard (about 1mm). But we also need to make a recycling shredder anyway, and Forrest has been getting interesting results with ABS precipitation to make powder. 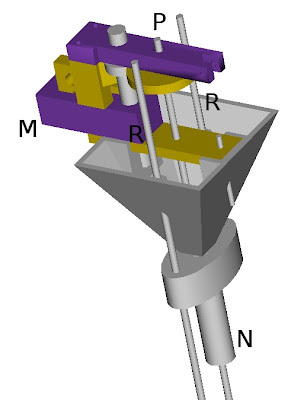 The central rod is M4 and is driven down by the larger gear, forcing granules into the PTFE. The mechanics are essentially the same as the previous design, so we have halved the radius and thus increased the pressure by a factor of 4. That should, I hope, shift the frozen plug and get the thing started. As before, all the force is taken by the rods (R) to a plate at (P) (not shown). All the pyramid hopper and central arrangement floats on those rods and sees no force, though the extrusion force will be considerable. Bother! 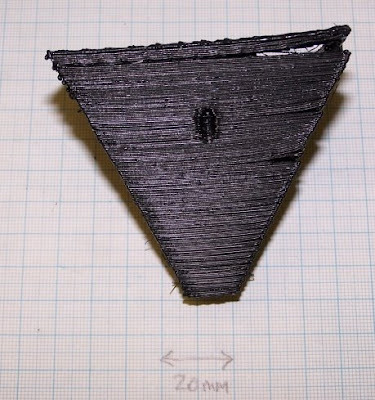 I made this using the hairdryer trick, and you can see the delamination top right. 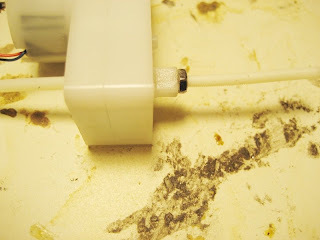 This proves that the hairdryer works really well to prevent this - that was the only corner to grow out of the hairdryer flow, and the only corner not to build smoothly. Serves me right for leaving it running while I drove into the university for a meeting with eD. Fortunately the part is usable - I'll just cyanoacrylate it in a vice and it'll be good as new. 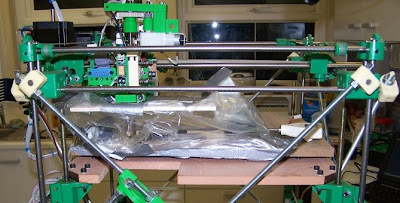 Russ Nelson has kindly compiled a Bill of Materials for the Ponoko lasercut RepRap. He did this with a markup language that is integrated into the web pages themselves, allowing him to pull the BoM out automatically for any web page using the same markup scheme. I am also able to offer a 50% discount on Ponoko's cutting costs to RepRappers. They currently have the V1.1 design available here but it has the words "Safe area" printed over the parts and I can't change it because a run is in progress. However the source files are in my user RepRap directory on SourceForge, and I can cut unblemished ones. Ralith is testing out the new 3.5mm ball-chain gears from V1.1 because the old design frankly didn't work. But the 3.3mm ones are just fine. 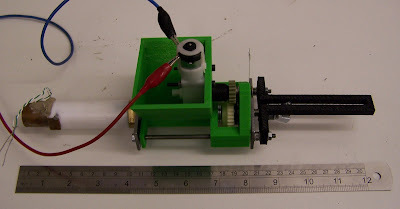 There is also a single RepRap extruder design available, containing just one extruder and a selection of gears for various motors. If you want the discount, get hold of either suz or vik at the diamondage.co.nz e-mail address and we'll set it up for you. Finally, there is a #reprap channel on freenode.net where a lot of real-time assistance can be had, and the RepRap Project has applied for stewardship of it. If you've not used IRC before, the best way is probably a Firefox browser add-on called Chatzilla. In which your narrator continues his efforts to get something for Adrian to put in his granule extruder... do you want to read more? ABS is a superb building polymer, but it does tend to curl up and delaminate as it's laid down because of thermal contraction. Inspired by Nophead's work and the heated base done by Metalab, I decided to try a very simple solution. I ran a build with a cheap hair-dryer (right) clamped above my RepRap machine blowing on the build. The result was perfect: there was no curl at all; the part built as flat as a pancake. The head was running at 240 oC. I put a thermocouple thermometer on the base at various locations around the build as it progressed. The result was a pretty constant 60 oC. Measuring the temperature of the part during the build with an IR thermometer gave 70 oC. Measuring the components of the extruder (including the motor) gave temperatures just below 40 oC; I directed the hair-dryer carefully to minimise the flow of hot air over them and the electronics. And here is the part fitted (right). This is the prototype granule extruder coming together. The part is the guide that stops the screw-drive rotating as it's driven against the polymer granules. 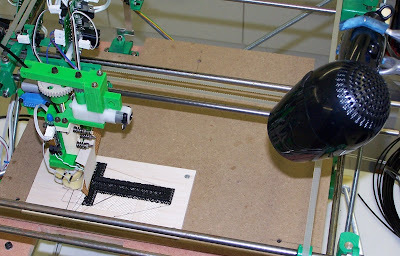 I made the hopper (green) in the Strat as my RepRap was in bits the day after I'd finished the design for that. 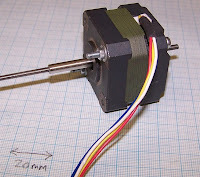 In which your narrator gets down to cases in the quest to design and build a more or less printable stepper motor... do you want to read more? The latest release of the Cartesian Bot files (1.0.6) are now available on SourceForge. This release includes assembly and part models in STEP and SolidEdge (v19, Academic Licence) formats, as well as the STL files.